Chateau Kamiya Dunkel is a 5.5% dunkel style beer from Ushiku Brewery that is part of their all year round range of beers. It’s brewed using malts only and can be found in bottles in the Chateau Kamiya shop or in the plethora of restaurants dotted across the vineyards. 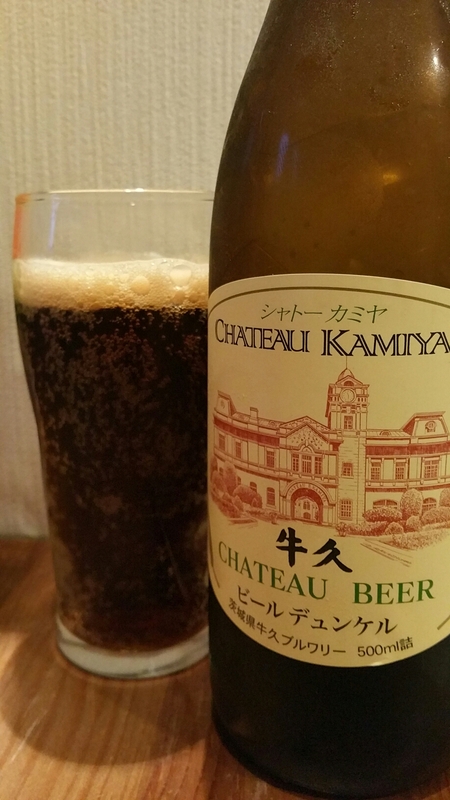 Chateau Kamiya Dunkel has also won two gold awards for best dunkel in Japan in 2012 and 2013. Dunkel dunkel where did you come from? Unfortunately, my wife had found this bottle of Chateau Kamiya Dunkel hiding in the fridge and was determined to drink it before I could, hence the dodgy glass for this picture. Not to say that the glass hindered or helped the beer but it felt weird not being able to use “my” glass for this beer. Oh well, guess it means I have to start hiding my beers somewhere. Chateau Kamiya Dunkel poured out a dark brown colour with a bubbly brownish head on top that seemed to be more carbonated than I like really. The head had a weird sponge like appearance to it, peppered with holes of varies shapes and sizes. The aromas coming off were quite sweet with caramel being the strongest followed up by some cocoa / chocolate aromas too. Of course, the roasted malts flavour punctuated through as well with a nice lacing of woodiness to it. The carbonation in the head was a good indication of what was to come as Chateau Kamiya Dunkel was a tad over carbonated for my preference and led to a few burps coming along. However, the rich, sweet aromas were not followed up as it the body was a bit thin and couldn’t muster up the same level of intensity of flavours. Chateau Kamiya Dunkel was still a nice beer to drink though and finished off with a roasted malt aftertaste that lingered until the next sip. Chateau Kamiya Dunkel is a nice dunkel but it isn’t going to set your taste buds alight with excitement.